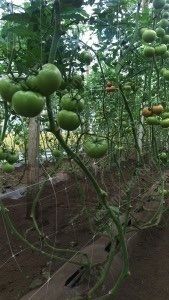 High macro-tunnels where indeterminate tomatoes can grow to be 8 to 10 meters in length. 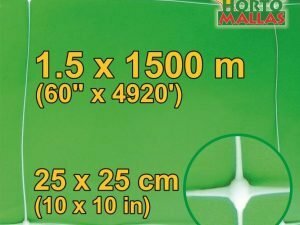 A plant this size will weigh a lot and will need a massive and heavy duty trellising system. The usual practice is to to run a cable from 3 to 4 meters above the furrows. The main cable will thick enough to withstand a downward force of 5 to 7 kilos per plant, therefore one needs to install the cable off the support posts of the tunnel or greenhouse but not attach the wire to the greenhouse structure. Once the main support cable is installed one can proceed to install the trellis netting to the wire. 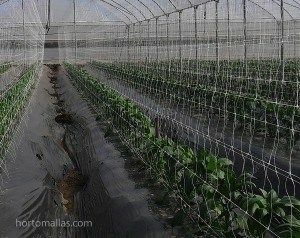 In order to connect the plant to the trellis netting, greenhouse growers may use clips or twist ties for the initial attachment or weave the plant in between the HORTOMALLAS´ meshes. 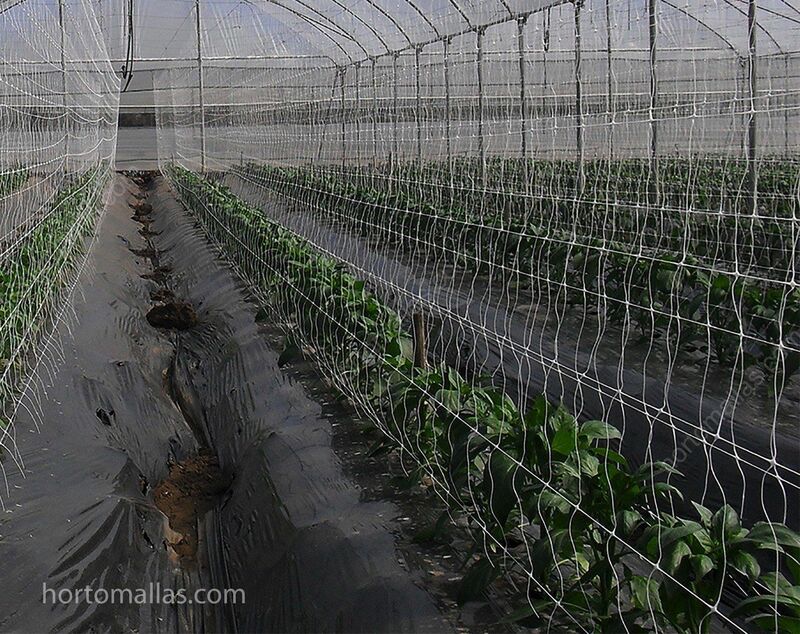 This trellis netting is very strong and can withstand 60+ kilos of weight per linear meter so its use is recommended even for growing melons. 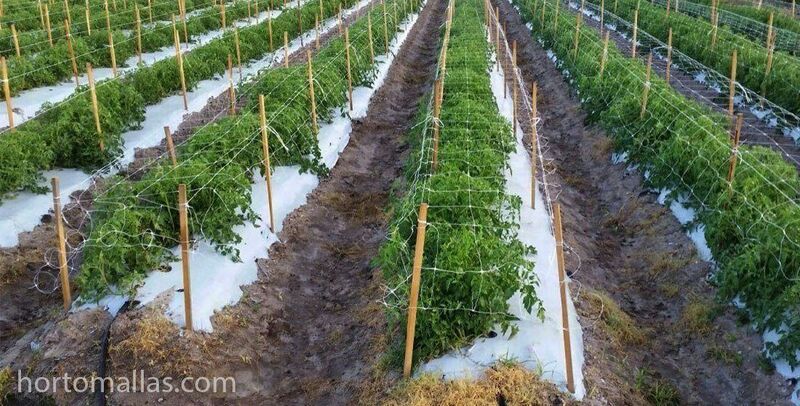 Tomato vines are then trained at about 30 degrees along side the trellis netting. 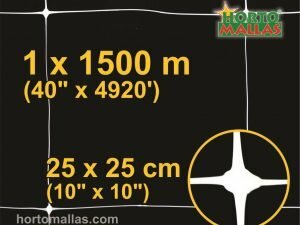 HORTOMALLAS came to replace the old way of trellising tomatoes on a raffia string, this method is very labor intensive and can cause the transmission of many pathogens for the excessive handling. 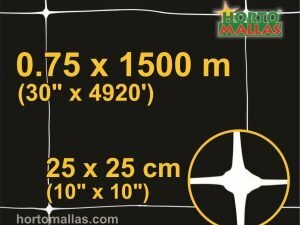 Many agronomists are suggesting to switch to HORTOMALLAS as it allows a more vigorous growth and more fruits of each vine. 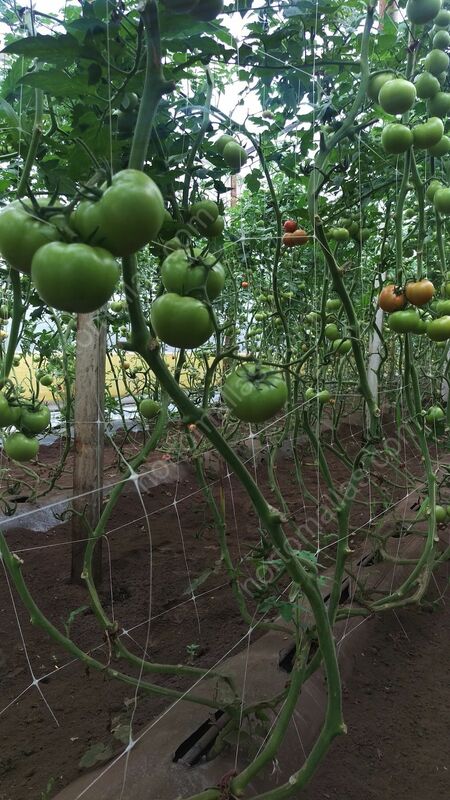 Also to be kept in mind is the production loss of 8-10% due to mechanical stress due to friction with workers during plant training, as the plant needs a few days to readjust its leaves after the manual tomato tutoring imposed on it by workers. 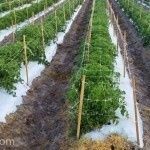 Furthermore a stressed out plant will be more prone to pathogenic attacks due to its immune system being overworked in an attempt to adjust its settings, for this and many more reasons HORTOMALLAS is the best training and trellising option for indeterminate tomatoes.